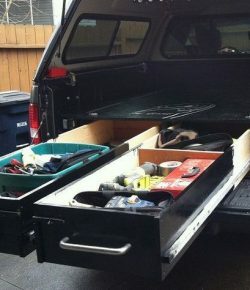 Learn how to install a sliding truck bed drawer system! Do you like heading off on a roadtrip in your pickup?? 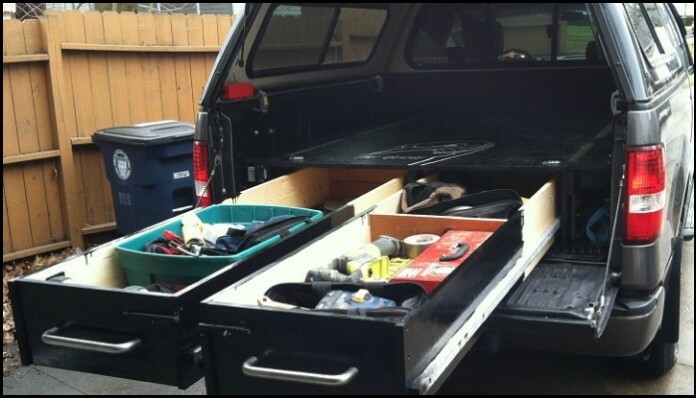 This upgrade project for your vehicle will make getaways even more enjoyable! Pickup trucks are great for heading off on an adventure with friends and family. 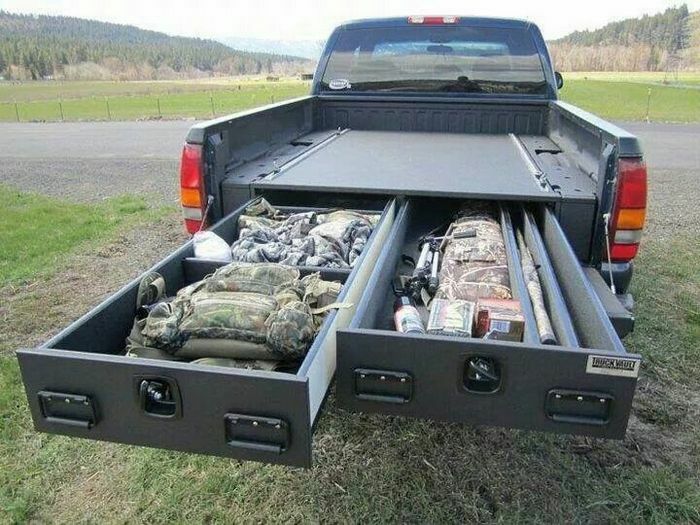 You can simply place a mat on the rear bed and you’re ready to relax and sleep. 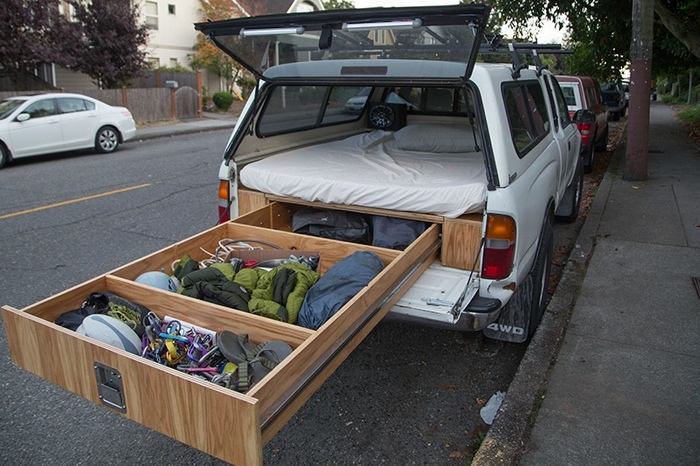 But getting a good place to lie down is impossible if you’ve got tons of stuff occupying that rear bed. 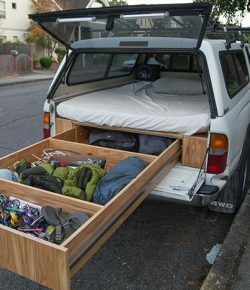 The solution is to build a bed with drawers in your truck, so that there’s a place for all your travel necessities and a place to sleep. Though this might seem like a big DIY project, it’s easy to accomplish as long as you take time with measuring and planning. 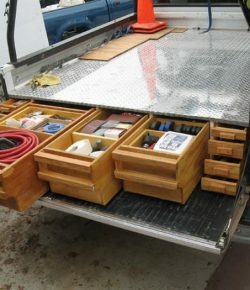 This tutorial shows you the essential features of a good truck bed and drawer system. Cut your masonit and 3/4 plywood about a half inch short of the length of the inside of the bed. Glue and screw them together like the photo. The board on the face was temporary. Slide it in the bed and center it. If you have a bed liner, mark the ribs at each corner. Drill the 4 corners and insert a 1/2″ bolt. The frame will not be able to slide left or right. 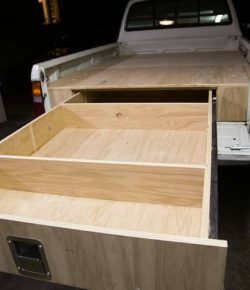 Build your drawers 2 1/4″ less then the openings. Cut a 1/4 inch grove at the bottom of the 1×10″ and glue the plywood to slide in for the drawer bottoms. Bolt the square tubing to the side of the drawers. About a 1/4 of the way up from the bottom. Making sure that the drawer will be about 3/8″ above the masonite. Then bolt the bearings on top and bottom. There should be at least a 1/8″ gap between the top bearing and square tubing when drawer is closed. Previous PostMake your own tandoor oven out of flower pots! Next PostDecorate your yard with a train planter made from old crates!